Has this ever happened to you? 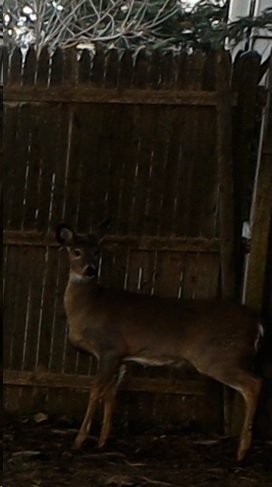 A large, young male deer jumped over the 7-foot fence in our backyard and startled me when I went to let the dog out. Startled the dog, too, by the looks of it. The funny thing is, I live in a downtown area, not particularly close to the woods. Our house is on the corner, bordered by two streets and an alley on three sides. That deer was the biggest animal our yard has ever seen, much bigger than the usual cats, rabbits, squirrels and birds. To put it mildly, he was magnificent. Every now and then someone will make what he considers an ordinary gift to a small nonprofit and find out suddenly that he is a “major donor.” The organization is surprised and excited. The donor’s initial reaction might be panic: why am I getting so much attention? My donation was not so big, was it? Oh geez, do they expect me to sustain this organization, or bring it out of a hole? Do I have to go to all the fancy galas now? The truth is, what would be a small or moderate donation to some will seem rather large to others, particularly in the absence of other donors of similar amounts. It can make a donor uncomfortable to find himself the big buck in the small backyard. If this happens, then you should do what you would normally do for every donor, regardless of the amount: thank him, ask him how many and what kinds of communications he would like from you, and keep him informed of the impact your organization has on the community. In other words, treat a big donor like any other donor, and treat any other donor like a big donor. Respect people for whatever contribution they choose to make and develop personal relationships based on meeting the donor’s needs as well as the organization’s needs. It’s really that simple. Having a large animal like that deer in my backyard was fun while it lasted, but clearly he was uncomfortable there among the squirrels. In the end, I walked away and let the deer jump back over the fence, and I haven’t seen him again. Maybe he didn’t like all the attention. Who are the bucks in your backyard? For more information on major donor campaigns and how to raise funds in small organizations, contact me. ← Is Your Database an Old Jalopy?